This Irish coin features a red deer, a beautiful animal, which exist in large numbers over Europe and pars of North Africa and Asia. The coins of the Irish pound feature many different animals. 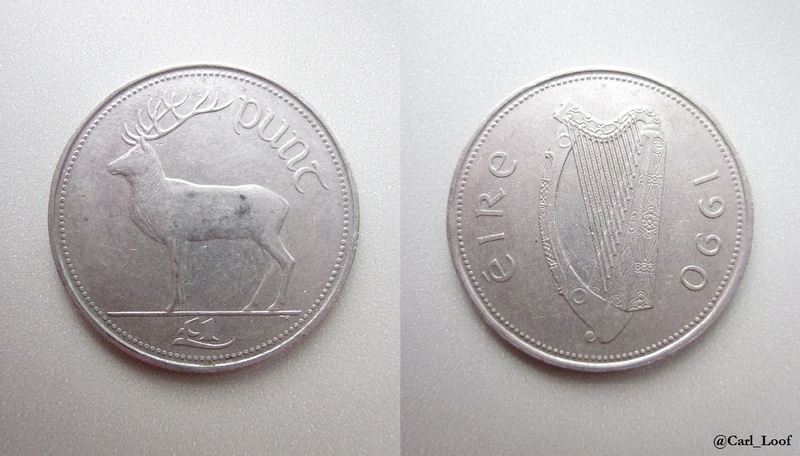 The red deer is the largest non-domesticated animal in Ireland and the 1£ coin was the largest coin of the Irish pound. The text punt is Irish for pound, and the text éire is the Irish name for Ireland. The harp is a classical symbol of Ireland and has a strong presence in the Irish culture. I recently heard a story about Queen Elizabeth I in the late 16th century banning the harp because it was a part of stirring the rebellions on Ireland. This gives the harp an even bigger meaning and it’s not hard to see why the harp would be featured in the coat of arms of Ireland. The Irish pound was replaced by the euro in 2002.